Biological & Physical Sciences - topics covered in such subjects as Organic Chemistry, Physics and Anatomy. Academic Skills Program - time will be allocated: 1) to evaluate a student's study habits, reading ability, thought processes, learning techniques, time management skills, exam preparation and writing techniques, 2) to train a student in how to modify and improve in areas where deficiencies are detected and 3) to verbal reasoning enhancing the student's skill in navigating this section of the MCAT. Individualized Educational Plan - Each student will receive personal and academic counseling which will be provided by a faculty preceptor or counselor. MCAT Prep Course: The MCAT prep course will provide students with the tools necessary to master the skills being tested during the MCAT examination. The course begins with a four-hour diagnostic test. A report will be generated based upon the results of this sample MCAT examination and will allow students to identify areas of strengths and, more importantly, areas of improvement. Students will also be evaluated midway and at the end of the program. Results of the individual evaluation will be used to build upon the individual education plan in an effort to identify areas of academic and non-academic improvement. Each student will receive home study books to also allow him/her to review and practice at their convenience. Clinical Component: Students will present orally and provide a written report, based on a specific clinical experience, the following: a medical condition or procedure, its history, epidemiology, current treatment or use of a procedure, and cost-benefit/risks. Research Component: Students will be provided with research opportunities on health related issues affecting underserved communities and be able to discuss in a written report and oral presentation, a detailed description, with illustrated examples, the following: 1) the scientific method as it applies to the original investigation, 2) methods of data gathering, recording, analysis and interpretation, 3) use of internet for literature retrieval, 4) communication of the results and 5) specific techniques used to conduct the research. Through a series of seminars, students will learn the responsible conduct of research, fundamentals of research design including clinical trials, and considerations in the use of human subjects and animals in research, including the role of the Institutional Review Board (IRB). 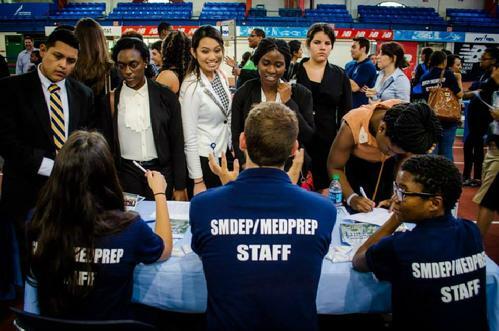 Students will also be exposed to various medical specialties and, ultimately, gain a broader understanding of the numerous healthcare issues plaguing underserved communities. Getting Ready for Medical School: Students will be able to generate personal statements, practice mock admissions interviews and fully navigate the overall application process. For a detailed course description, New Jersey residents should visit the New Jersey Medical School website and the New York residents should vist the Columbia University Vagelos College of Physicians and Surgeons website.